But don't despair, because there is still great value in bringing part of your literary works to the medium of video. The following is offered as a prompt to thought on your approach to the subject and to foster discussion. Negatives are addressed as well as the positives. YouTube does not have a separate category for literature or books. Anything literary we do, we have to mark as “Entertainment”. Okay, file that away for later consideration below. What it does suggest to me is that YouTube is a very blunted platform for books and literature. Videos of literary heavyweights like Philip Roth get 8-10,000 views. Stephen King interviews garner a more promising 130-250,000 views. Cute cats however get 5 million hits. ‘Fat' kids dancing (not my tagging, theirs) gets between 500,000- 2 million views. Lady Gaga videos have 100 million views. She herself has over a million subscribers, not views, SUBSCRIBERS! You begin to see my point. YouTube's mass audience, the mystical viral video, is not likely to be inclined to things that are not cutesy, kitsch, mass produced artifacts of pop culture (if you can even use the word ‘artifact' for something so disposable as most of these videos). YouTube is all about entertainment. That in itself is not actually a bad lesson to draw. Our videos have to be entertaining. They have to work in their own terms, that is you might want to consider that they ought to stand on their own feet, irrespective of the book they're promoting. People surf, land on and watch your video because they find it entertaining. Then maybe, just maybe, they'll further act to buy your book. Don't hold your breath though… Just because they respond positively to your VIDEO doesn't mean they'll necessarily even be a reader. Think about the relationship of the music video to the song it is there to promote. Unless the video is just live performance, it has its own (storyboarded) narrative. It works as a video, as a mini filmic narrative story, over and above the song. Try watching a good music video with the volume on mute. It still works, it conveys its story. Consider how many current movie directors cut their teeth shooting music videos. A book trailer ought to have the same artistry. While it's there to promote the book, it too should contain its own narrative story. One told in the visual language of film, of moving image. Watch your trailer with the sound on mute. It's a useful exercise, especially if the potential future viewer will watch it with their iTunes playing, Tweetdeck and e-mail pinging them and so on. The YouTube viewer is likely a multi-media multi-tasker. It is an interesting juxtaposition to employ the moving image to promote the static block of text that is the printed word. It seems that written words can no longer speak for themselves. Book trailers are a relatively new phenomenon. I think they arose out of the explosion of authors needing to find new ways to try and secure visibility in the increasingly crowded market place. Allied to the accessibility of cheap and simple video technologies together with file sharing. But as I hope I've suggested to this point, it is not necessarily a marriage or a match-up made in heaven. I'll return to book trailers later. YouTube allows for the personal touch. It makes stars of cats and fat kids dancing. It is a medium that revolves around personality. Authors may want- actually scratch that- OUGHT to consider the personal approach. Videos of them talking about their books, perhaps where the idea originated, an anecdote from the research process, authors of similar work who inspired them etc. Videos of them being interviewed, so that there is an authentic dynamism rather than a rehearsed feel to the content. Authors reading their work to camera, ideally in live performance with audience ambience and applause to validate the status of the author. I do want you to reflect on the actual content of a video where you are reading to camera. What is there for the viewer to look at while your words attempt to weave their spell? In truth, not a lot. It is not very visual. Unlike a slam poet who can punctuate their words and rhythms with gestures and hand motions, a novelist is tied reading from their book or script in hand. (While an author may learn a short passage off by heart, then we lose the visual connection to the fact that it is a book we're trying to promote here). The book may block part of our face. Or we may have our eyes cast down to read and not engage with the camera. Reading in the surroundings of your study, surrounded by the spines of books may look august, but it can also seem as though you're reading to yourself and trying just a bit too hard to plead for someone to be interested in what you have to say. The gravitas of a book may actually work against you here. And finally, unless you're reading a self-contained piece, or the opening to your book, your words are somewhat ripped from their context within the novel and may not have the desired effect on the viewer, who hasn't had the benefit of reading all the words preceding that point in the novel. Here's an example for how to mix it up a bit. You're still doing a reading, but maybe you start the video screened off by a tower of books. While you read- so effectively a voiceover- a helpful hand removes a book from the tower, gradually revealing you to camera. A bit of fun injected into it, the association with books and literature (and depending on the focus of your camera, an association with the names on the spines), yet with the implication that your book which emerges by the end, is going to blow all those other books out of the water in its insistence to be heard/read. Visual you see. A tweak on the plain author reading… Of course we can't have all authors pulling this stunt, but someone's welcome to it for free. But like I say, it's illustrative of how you need to think about how you're going to frame your reading. The above example also proves instructive with regard to trailers. For the purposes of this point, I'm going to assume we are only uploading to YouTube, though subsequent points after this one consider other opportunities. I've given lots of thought to the YouTube demographic — the generations that have grown up with it. They are likely to be younger than me and possess a different visual language. It may be a simplification, but while there are plenty of people my age who view YouTube, it is dominated by the younger generations. Maybe this is good news if you've written a book for children or young adults. But it is certainly something to bear in mind when you're tailoring your video for its target audience. I took the decision to make 5 reading vids in place of a single trailer, but to couch them in what I perceive to be the visual language of YouTube. They are all voiced over, (not by me since the MC voice is female) and acted out with toys and miniature props. In a way they are small-scale equivalents of the music video. One scenario was full of bar table props, cocktail parasols, olives, sugar sachets, carnation in a vase (pulled slowly apart, ‘she loves me, she loves me not') and a bottle of nail varnish (The English flag painted on nails during course of vid). Another has two wind up toys. In a third, the MC's hands are filmed writing the words ‘Wish you were here?' on a postcard (shades of Bob Dylan's video for “Subterranean Homesick Blues”). Another I had some commissioned art works of fired clay human torsos and limbs and manipulated them for the duration. Now I can't unfortunately comment on the success or otherwise of this approach, because 18 months after they were shot, my video guy has only got one finished video to me from the 5. But that's a whole other story. Suffice it to say, if you're going down the YouTube route, I think you need to think about the visual language of that particular medium. There are other outlets for our videos other than YouTube. It seems key to me to have your videos on your own website, blog, FB and especially your Amazon Author page. We have to target readers, people whose main interest in coming to these sites is because they are looking to buy books, which is not necessarily true of YouTube. Then there are other dedicated book sites and trailer sites, such as Blazing Trailers. There are collectives of authors such as Indie Writer Network who have a dedicated trailer section of their website. There are other sites that collaborate to promote certain genres, such as YA or Fantasy, pooling their trailers. Tube Mogul is a platform that lets you monitor how much your videos are being viewed across all the platforms you have it uploaded to. The first consideration is cost. Not all authors can afford to throw $800-$1000 at a trailer. The good news is you can do it for virtually nothing and elsewhere the committee will offer you practical guides and tips for making movies on either PC Windows Media or Mac iMovie. Personally, I don't think trailers justify a large chunk of your marketing budget. I'm skeptical that they lead to significant sales. Their value is more in offering a different slant on your book, and in having varied content on your Amazon Author page or your dedicated book website. They add another interesting strata if not serving as a killer sales tool. Okay and here I bare my chest and expect to take my licks, but most trailers I've viewed are so similar as to meld into one. And here I speak of the cheap-to-make ones, not ones with real-life actors, or bespoke animations made by proper animators. I mean those computer-generated image packages which look like YA illustrations (handy only if you've written a YA book, otherwise failing to lend much weight if your book is a thriller or romance book). You know the ones I mean. A horror book with a skull and blood and possibly a raven wafting across the screen. A fantasy book will almost certainly have the word ‘Quest' scroll across its trailer at some point. I'm afraid these trailers are simply unremarkable and a book can hardly stand out as being different from any other when handled this way. Use your imagination to make your video look different to every one in that genre that has gone before. For example, I viewed a trailer that was entirely composed of what looked like security camera footage of someone being kidnapped in a car park and bundled into the trunk of a car. Unsurprisingly it was a thriller being promoted. To me it had a kind of “Blair Witch” campaigning feel about it. The viewer is left asking themselves what they just viewed: was it real footage? Was it specially filmed? Is it found footage that just happens to fit in with the book? What's the precise relationship of the film to the book, ie is the book that grittily real? Anything that makes the viewer linger over your video and think about it beyond the 90 seconds that the viewing lasts. Words are our currency as writers, right? It always surprises me that so many trailers have very few words and almost none actually have an example of the text in them. Ultimately a book is about its words, so why not give a taste of the style to the trailer audience? It may only be a couple of sentences, but make them killer ones. I mean if you were tweeting about your book, you may include your favorite sentence in that, right? And there you've only got 140 characters to play with. With a video you are unlimited. Also consider you the author reciting those two sentences as a voice over, the personal touch again. So there you have it. I hope this has provided you much food for thought. I do urge you to plan absolutely every last detail in advance of shooting. Storyboard it from beginning to end. Think in terms of the medium of film and video first and foremost; your book just happens to be the subject matter. Set a budget that is commensurate with what you can afford and maybe more significantly what you expect. You must retain a realistic notion of what a book video is going to achieve. That's why I would urge us to forge our own dynamism of debate and agenda setting within literature itself in order to make us a resource where interested readers who want a bit more over and beyond the book but about literature itself come to have their needs met. If we're talking intelligently about literature and setting agendas, then maybe they'll also turn to our books to see what we mean. Over to you guys now. Marc Nash is a writer of difficult literature, challenging notions about the form of the novel, language and the nature of storytelling. 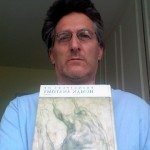 He has two novels out on kindle as well as a collection of flash fiction, a website on each of the novels “A,B&E” and “Not In My Name” and a YouTube channel with 16 book-related videos. Come say hi on Twitter with @21stCscribe. Marc lives and works in London for a Freedom Of Expression Charity and until recently managed his sons' soccer team which was way harder than anything to do with literature. Well, I can agree with MOST of what you say – up until you talk about text. I spent 25 years working in film and video – most trailers have two or three times the amount of text an average person can process reading off screen. Narration rather than text is the best way to get the words across, especially if you want excerpts. Authors tend to be very literal in their portrayals – they need, in general, to think of the trailer as more of a tease, a glimpse something to intrigue you with atmosphere. While I can agree that there are many tools available so anyone can make their own, it takes more than that to do it well. Hi Sessha, we don’t disagree I think. I too call for author narration over extended text where possible. But I am always amazed that book trailer text is limited to one or two scrolling/flashing words. I understand your argument for a tease, but I wonder if books are not a different sell to cars or detergent? It probably depends on the genre, but I think literary calls for something with a bit more gravitas, though something YA you can definitely make lighter. Erotica, well that’s a whole different kettle of fish!